Whatever the winter sport you enjoy, you need to ensure you have adequate ski insurance to cover any injuries, breakages, recovery from the slopes and also equipment loss or breakage. From an annual cover policy through to a single trip for a weekend in Europe, we have ski insurance policies that just about cover every type of winter sport activity (see our specialist insurance section). 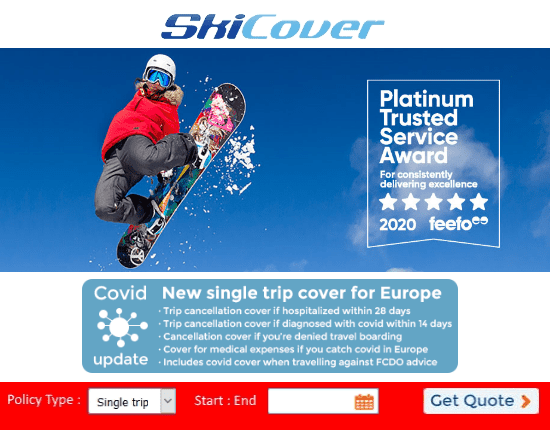 Whether that's off-piste, ski season insurance, heli-skiing or ski instructor cover, you'll find exactly what you want. Reading the small print is your key to buying the right policy. Ski insurance is essential, alongside your EHIC card for Europe, so don't be tempted to skimp and save. A single policy covering the whole family for a years holidays including skiing! A policy covering you for your week in France, Italy or Switzerland - perfect! Going to spend a whole season on the slopes - lucky you! Get a good policy to cover you properly. A proper off piste insurance policy - covering you for whatever happens in the powder!